The December CPI report met expectations across the board. Headline CPI was -0.1% month over month which fell from flat in November. As you can see from the chart below, the decline in oil caused yearly CPI to fall from 2.2% to 1.9% which is below the Fed’s 2% target (the Fed looks at PCE closer than CPI). Core CPI, which doesn’t include food and energy, was up 0.2% monthly and 2.2% yearly. Both were the same as last month. Since wage growth is deflated by headline CPI and not core CPI, this divergence is great for real wage growth. This modest inflation allows the Fed to avoid hiking rates in the near term. Even though it seems like the cycle might be near its end, inflation isn’t running out of control, so the Fed doesn’t have to hike rates. Specifically, core inflation was down from 2.24% to 2.21%. Because December inflation last year increased from 1.71% to 1.76%, the 2-year inflation stack actually increased. It seems like core inflation will likely fall in the next few months because the comparisons are about to get much tougher. 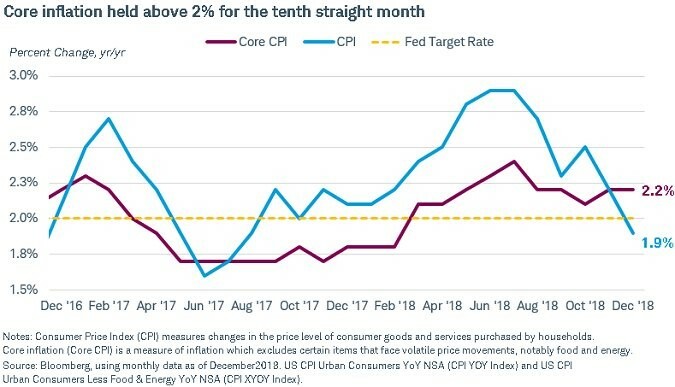 If core inflation falls below 2%, it will allow the Fed to not hike rates at all in 2019 (guidance is for 2 hikes). Of course, the real reason the Fed shouldn’t hike is because economic growth is slowing, but sometimes the Fed needs an alternate alibi. We have been harping on the thesis that real wage growth would be strong in Q4 for the past few months. The thesis has come true in December because of the tight labor market and the decline in headline inflation because of the crash in oil prices. Real hourly wage growth for production and non-supervisory workers was 1.5% in December. As you can see from the chart below, these workers had 1.2% real weekly wage growth. 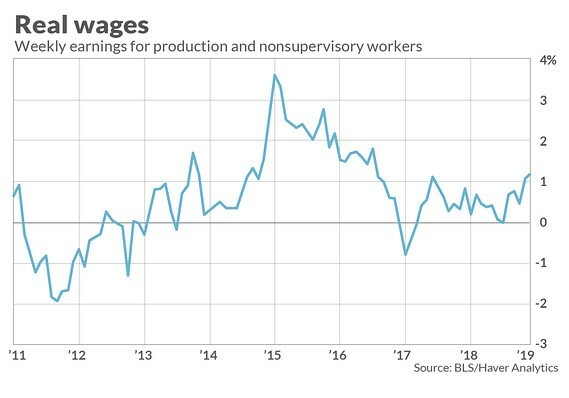 Keep in mind, this wage growth is the most important of this cycle because most workers have jobs. High wage growth with a high unemployment rate doesn’t help nearly as many people. Even though the political rhetoric claims workers never get a real pay raise, this cycle has been great for real wage growth. This won’t stop politicians from making the same points because workers are always going to want more wage growth, and envy is a strong feeling.